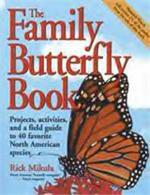 With full-color photographs and illustrations throughout, this book explains how to identify, care for, and raise butterflies in your own backyard, whether you live in an urban or rural setting. 176 pages, paperback. 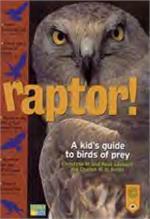 Provides up to date information on the 18 species of owls found in the United States and Canada. Includes detailed descriptions, habits, and range maps. Illustrated with color plates and black & white photographs. 208 pages, soft cover. Contains 150 color photos of birds, nest boxes, nestlings, and eggs. 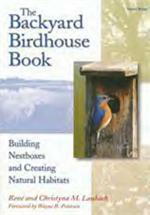 This book will help you discover the fascination and importance of nest box monitoring. 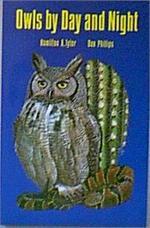 This book contains species-appropriate nestbox designs for North America's most fascinating cavity-nesting birds. Full Color photographs and illustrations. 216 pages, paperback. Full color illustrations of the following species: Great Gray Owl, Northern Hawk Owl, Northern Pygmy Owl, Northern Saw Whet Owl, Shorteared Owl, Snowy Owl, Spotted Owl, and Western Screech Owl. Chart measures 24" x 36". Illustrates 13 species. 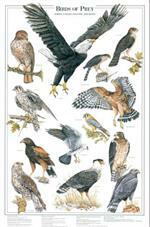 The Bald Eagle,Red-tailed Hawk, Sharp-shinned Hawk, Coopers Hawk, American Kestrel and other popular hawks are included in this identification chart. Chart measures 24" x 36". 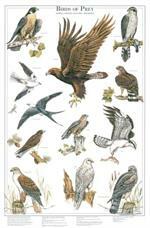 Illustrates 12 species including the Golden Eagle, Peregrine Falcon, Northern Goshawk, Merlin, Osprey, and Marsh Hawk. Chart measures 24" x 36". 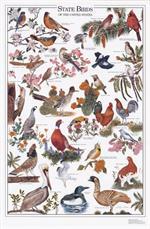 This masterful print depicts all the official state birds of the U.S. in high detail. Scientifically accurate and a great educational tool. Chart measures 24" x 36".